Kugisho MXY7 Ohka (Cherry Blossom) 22 on display at the Steven F. Udvar-Hazy Center in Chantilly, Virginia. The Okha-22 Cherry Blossom. While a number of the rocket-powered Ohka 11 versions exist in museums worldwide, the NASM MXY7 Model 22 is the only "Campini" jet-powered example surviving. Paul Garber (in cockpit) oversees the installation of the Kugisho MXY7 Model 22 Ohka (Cherry Blossom) kamikaze suicide bomb in the Arts & Industries Building. It was nicknamed by Americans "Baka" (Japanese for "idiot" or "fool"). The Ohka was transferred to Smithsonian in 1948 and displayed at Arts & Industries until the early 1970s when it was moved to the Garber Facility. 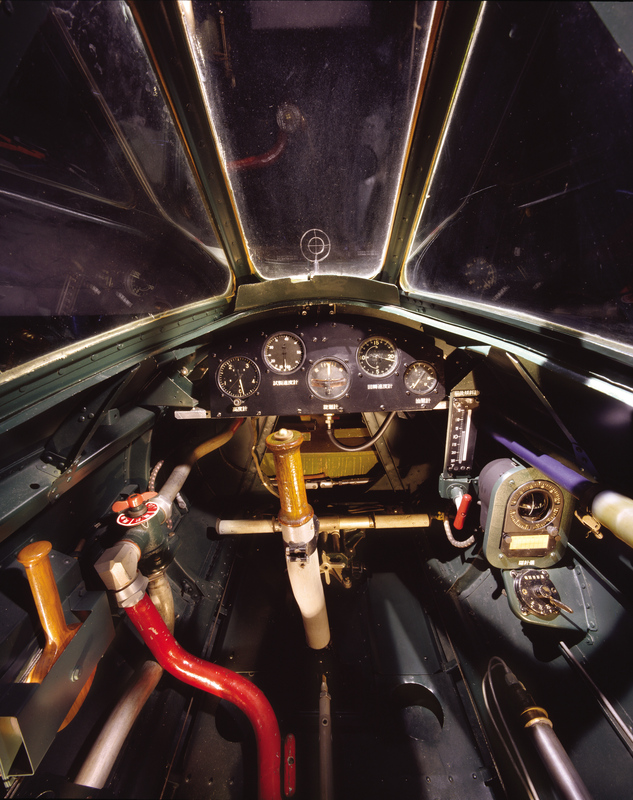 Restoration began in 1994 and it was placed on display at the Steven F. Udvar-Hazy Center in 2003. Near the end of World War II, Vice Admiral Onishi Takijiro recommended that the Japanese navy form special groups of men and aircraft to attack the American warships gathering to conduct amphibious landings in the Philippines. The Japanese used the word Tokko-tai (Special Attack) to describe these units. To the Allies, they became known as the kamikaze. By war's end, some 5,000 pilots died making Tokko attacks. 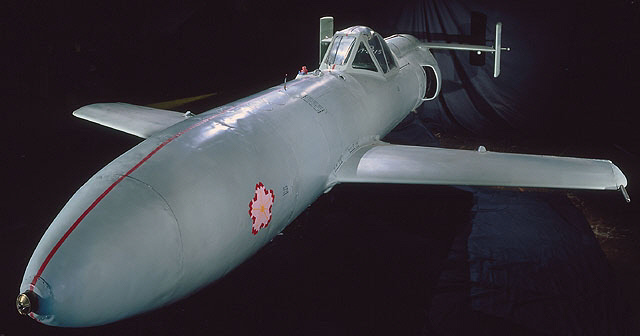 The Ohka (Cherry Blossom) Model 22 was designed to allow a pilot with minimal training to drop from a Japanese navy bomber and guide his aircraft with its warhead at high speed into an Allied warship. Plans were afoot in 1944 to adapt a version of the Yokosuka P1Y Ginga (Milky Way, Allied codename FRANCIS, see NASM collection) to carry the Model 22. While several rocket-powered Ohka 11s still exist, this Ohka 22 is the only surviving version powered by a motor-jet, which consisted of a reciprocating engine that pressurized a combustion chamber into which fuel was injected and ignited. Allied forces recovered the Ohka 22 in Japan in 1945. Unlike the Ohka 11, the Ohka 22 never became operational. The Ohka 22 was a human-guided missile specifically designed to allow a pilot with rudimentary training to crash himself at high speed into an Allied warship. The idea for this type of attack took shape late in 1944 as Allied air and sea power continued to systematically crush the Japanese war machine. On October 19, Vice-Admiral Onishi Takijino recommended that the Japanese Navy form special groups of men and aircraft and launch them against American warships gathering to conduct amphibious landings in the Phillipines. To the Allies, these units became known as Kamikaze, or suicide squads. The Japanese used the word Tokko, meaning Special Attack. A number of philosophical concepts motivated the Tokko pilots. The ultimate sacrifice to save homeland, countrymen, and emperor; duty to "Bushido," the warrior code of honor and conduct; and the belief that Tokko missions could reprise the miracle of the original "divine wind," a typhoon that destroyed a Mongol invasion fleet in 1281. It is estimated that by the end of the war, 5,000 pilots had died making Tokko attacks and the damage they wrought was severe. During the invasion of Okinawa in April 1945, the U. S. Navy had 21 vessels sunk and 217 damaged. Casualties were horrific. Navy crews suffered 4,300 fatalities and 5,400 wounded, seven percent of all crew casualties incurred during the entire Pacific war. Tokko pilots flew almost every type of Japanese military airplane, but initial operations showed the need for an aircraft designed and built specifically for this mission. A typical Tokko attack had to withstand withering anti-aircraft fire and protective fighter screens. Large numbers of small airplanes that were difficult to target and quick and simple to construct seemed to be the answer. Ensign Mitsuo Ohta conceived the idea of a small rocket-powered Tokko aircraft. Helped by personnel at the Aeronautical Research Institute at the University of Tokyo, Ohta proceeded to refine his concept and submit it to the Japanese Navy. Navy officials were impressed and the project gathered momentum. The First Naval Air Technical Arsenal (abbreviated Kugisho in Japanese) at Yokosuka responded in a few weeks with the MXY7 Ohka 11. This single-seat, flying bomb packed a large warhead in the nose and employed three small rocket engines mounted in the tail to extend its range. The Ohka 11 was brought within striking distance snugged to the belly of a twin-engine, Mitsubishi G4M BETTY bomber (NASM has the remains of a BETTY forward fuselage section and engines). The Ohka's combat debut ended disastrously on March 21, 1945, when Gruman F6F Hellcats (see NASM collection) intercepted 16 BETTYs carrying Ohkas 11s and shot down the entire group. Most of the Ohkas fell into the sea. The BETTY bomber crews had to fly within about 23 miles (37 km) of a target due to the Ohka 11's limited range. The distance was well withing the range of U. S. Navy combat air patrols. To solve the problem, Kugisho modified the Ohka 11 to develop a new model called the Ohka 22 with a range of about 130 km (81 miles). 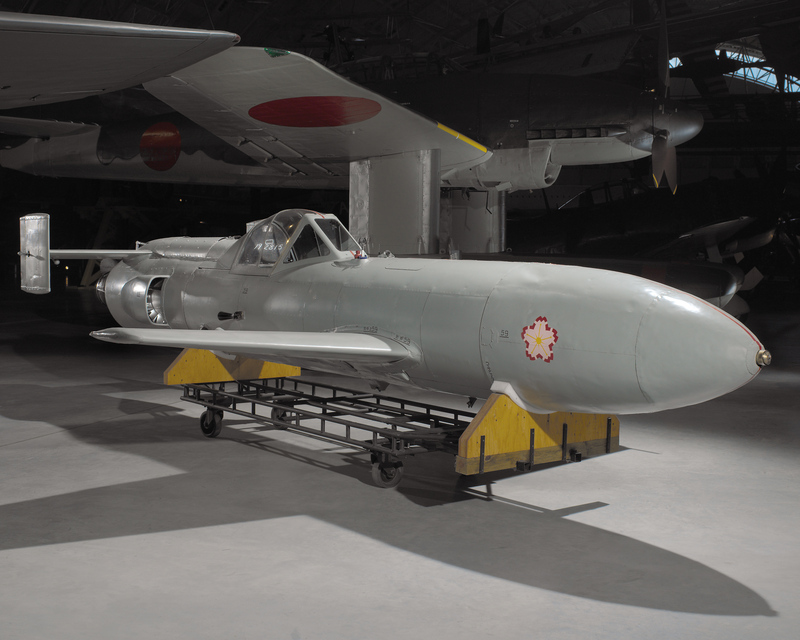 They halved the size of the warhead to 600 kg (1,323 lb) and they adapted the Ohka 22 to fit the Yokosuka P1Y1 Ginga bomber (see NASM collection). The Ginga was faster than the BETTY, which gave the Ginga crews a better chance of escaping the defending American fighters. Engineers also installed a new hybrid motor-jet engine built by Hitachi called the Tsu-11 consisting of a reciprocating, 4-cylinder, inverted in-line engine (Hitachi Hatsukaze 11, Ha11-11) fueled by gasoline and producing 100 horsepower. It drove a single, one-piece, air compressor wheel. Aft of the compressor near the tail of the Ohka, Kugisho mounted a ring of fuel-spray nozzles. To operate the device, ground crews first started the Hitachi motor prior to take off. The Hitachi was left to idle through takeoff, cruise, and separation from the mother ship. At this point, the Ohka pilot applied full power to the motor and ignited the fuel/air mixture. The compressor propelled the hot gases from the spray nozzle, functioning similar to the afterburner on a jet engine. The engine generated a total of 441 lb (200 kg) of thrust. Kugisho finished 50 Model 22s while production shifted to underground factories. Only three Tsu-11 engines were built, so most of the airframes remained incomplete and the war ended before any Ohka 22s saw combat. Several other versions were planned. The Ohka 43B was designed for launch from land-based catapults. These simple devices were easily hidden in caves. Had it become necessary to carry out Operation Olympic, the proposed Allied invasion of Kyushu Island, the Japanese would likely have employed many hundreds of Ohka aircraft against the attack. Tens of thousands of Allied and Japanese lives could have been lost. While a number of the rocket-powered Ohka 11 versions exist in museums worldwide, the NASM MXY7 Model 22 is the only surviving example powered by a motor-jet. The aircraft was probably shipped from Japan in November or December 1945. The first known photograph of it was snapped at Naval Air Station Alameda, California, on December 22. It shows the missile without engine or air scoops. Sometime later, navy personnel added dummy rocket tubes to make the aircraft look like a Model 11. The station displayed the aircraft for a time, and then transferred it to the National Air Museum on April 15, 1948. It was displayed at the Smithsonian Arts and Industries Building until the early 1970s when museum workers moved it to the Garber Facility. NASM restoration staff began working on the aircraft in January 1994. They had to fabricate the missing air scoops, install an engine, rebuild the cockpit, make minor repairs to the skin and airframe, and repaint and re-mark the machine. Finished in 1997, the restored Ohka 22 has been on display at the Udvar-Hazy Center since December 2003. Transferred from the United States Navy, R. Adm. A. M. Pride. Single-seat, all-metal monocoque construction and conventional layout with low wing and twin vertical fins and rudders, powered by "Campini" jet engine.